The Essence of Reiki 2 is the second Reiki manual in our series of 3 Reiki manuals that cover everything you need to know about the Usui method of natural healing. 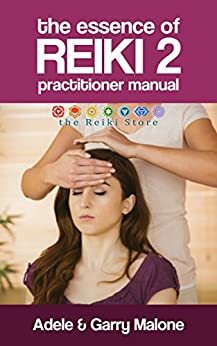 The Usui Reiki Level 2 Advanced Practitioner Manual is a wonderful guide for those Reiki students who have already completed Reiki Level 1 and are now ready to move on to the more advanced Reiki techniques taught is the second degree. There are 18 lessons which will guide you and mentor you through the three pillars of reiki and introduce you to the sacred reiki symbols and show you how to use these symbols to boost your reiki energy vibration and how to perform distant or absent healing. Reiki 2 opens up a new pathway to healing with unlimited possibilities and applications. Similar books to The Essence of Reiki 2 - Usui Reiki Level 2 Advanced Practitioner Manual: The Complete Guide to the Second Degree Usui Method of Natural Healing. The Essence of Reiki 2 really got me started in my business. It continues where the Reiki 1 guide leaves off and continues with all the information one would need to begin healing others. I appreciate the way in which Garry Malone presents the information. It is clear and easy to understand. Other books I have read have included some of the personal views of the author which I found a little distracting - like alien origins Reiki, or that cats invented Reiki, or that spirit guides are involved in Reiki. None of this has any factual basis, and therefore is not included in the Reiki 2 guide. Malone gives information that you can really use in your Reiki practice. I would suggest this book to anyone who wants to take Reiki past Level 1. This is more of a booklet than a book, and extremely overpriced for what it is. Poor content. Definitely not worth $19.97. Save your money. Returned right away! Fairly informative book. I found out things by reading this book that i wish i knew about 5 years ago. This book makes for a good starter, however I recommend that if this is what you want to do to take a class. It does work great for having a little information prior to a class. Definitely recommend! This is one of several books by the same author! On my shelf as a reference. Solid support for my studies.